EVE Blog Banter #11: The Few, the Proud, the next Tech 3 ships! Welcome to the eleventh installment of the EVE Blog Banter, the monthly EVE Online blogging extravaganza created by CrazyKinux. The EVE Blog Banter involves an enthusiastic group of gaming bloggers, a common topic within the realm of EVE Online, and a week to post articles pertaining to the said topic. The resulting articles can either be short or quite extensive, either funny or dead serious, but are always a great fun to read! Any questions about the EVE Blog Banter should be directed here. Check out other EVE Blog Banter articles at the bottom of this post! This month's banter comes to us from Joe Brusati a long time reader of CrazyKinux's Musing, who asks the following: CCP states that T3 Strategic Cruisers are just the start for the T3 line-up. In future Eve expansions what would you like to see as the next T3 ship type. Please be specific on details about what role this ship would play, cost of manufacturing, and the different modules that would be available for it, and of course you must give your T3 ship a name! Well, I definitely wanted to participate in this month's Banter, but an unforeseen event last week prevented me from doing so, as well as preventing me from posting anything on this blog since last Tuesday. Indeed, though my wife and I were expecting our second child to come into this world sometime in early September, the little fellow had other plans and stepped into the spotlight on Thursday morning. Let me tell you that this surprise "happily" wrecked my well planned schedule for the next few days. I'll have more on that story in another post. But for now, let's get to the Banter articles! Thanks to all those who participated, and my apologies for being a day late! Level Cap - EVE Blog Banter #11 - I Can Haz Tech 3 Battleships? When I set out to organize this contest earlier this month, I certainly didn't expect to receive so many good submissions, and neither did I expect to be right on the money by choosing "planetary control" as a subject matter. Though the DUST 514 announcement (for a console-based FPS that would impact the MMO) will have an interesting effect on EVE's sovereignty, it has in no way affected the judging of the articles for this contest. In judging these amazing articles, I'm not only look for originality in the concepts being put forward, but also in the quality, clarity and originality of the writing. Here below is the full list of participants, as well as a few late comers who, though they will not be eligible to win, still deserved to be given a good read! Enjoy and wish me luck! Achernar - Depopulate, repopulate. Lololol. I'm still going through the list, and should have the results by the end of the week, unless unforeseen events prevent me from doing so. Last, but not least, thanks to my mate James Egan over at Massively, for giving the contest a bit of the limelight! Well what a week this was for EVE Online! And we're still weeks away from the October Fanfest! That promises well then, doesn't it! Let's get to it then shall we. Sweet Little Bad Girl: Another milestone - Congrats! The EVE Blog Pack Expansion - This is your chance! RPS Asks: Do You Build Your Own PC? Lots to read as you can see! Enjoy. The EVE Blog Pack is over a year old by now, and despite some tweaking here and there, it's in need of some much needed TLC. Indeed, some of its members have stopped writing and over the last few months we've seen a significant increase in the number of dedicated EVE blogs - some of which are definitely Pack material. Add to that the constant influx of emails and enquiries I receive about wanting to be included in the Blog Pack. It was time I overhauled the membership. So today, as one contest comes to a close, I'm opening the door and giving a chance to new bloggers to join the rank of this elite EVE blogging crew. I'm also giving a chance to those outdated blogs, whose authors have neglected to feed in the last few weeks, dare I say last few months. Update those blogs, lest you'll be bumped off the Pack! Interested bloggers simply have to submit their blog URL in the comments below, not forgetting to explain why they believe they should become a member of the Pack. In order to be fair, I'll be increasing the number of pack members to 40 and accepting submissions until the end of the month. Come September 1st, I'll review the applicants and make my choice as to who makes the cut amongst the new members. Rest assured, the "active" members have nothing to worry about. The ones with out of date blogs though, do. You've been warned... mouaahhahahahhaha!!!! It's been a few days now about CCP Games big announcement. And now that the dust has settled (punned intended), I thought it would be interesting to list some of the coverage it got; both from the industry coverage as well as by the gaming/blogging community. Enjoy the read! DUST514.org - A dedicated site by Eddie Gordo that showcases all related news! 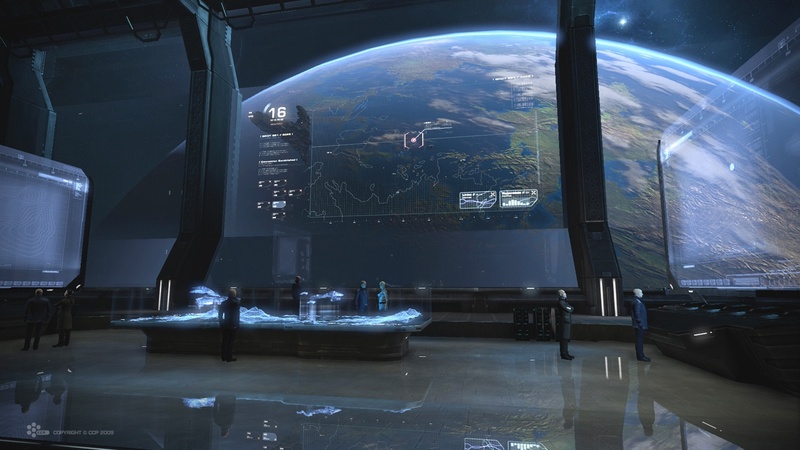 The Daily Grind: Will you be trying out DUST 514? Biomassed, Perplexed and Langour: Get out of my space! Quick! Someone grab the Swiffer! If you've written a post about this new EVE-based FPS, then please let me know about it in the comments and I'll add it to the list if I deem that it's relevant. Before I get into the details of the new rig I'm about to put together, let's take a trip down remembrance lane. I first heard about EVE Online sometime circa 1999-2000. At the time I was working at IBM and had jut gone from a Mac to an IBM PC300 tower. I could run Diablo at an average setting, but that machine wasn't what you would call a PC Gamer's Dream Machine, far from that! Really far... as in far far away in an other galaxy kind a distance. Fast forward to 2002, when I finally got EVE and put it onto that machine, I believe it ran at about a frame a minute. And I'm being generous here! Suffice to say, this gamer needed a better rig. And so began the quest to build myself a PC. After reading profusely various computer power user magazines and books, I finally put together a decent system (at the time). It ran a P4, 500Mb of RAM and a Radeon 9800 Pro (after an early upgrade from a 9200). Over the next few years, the system would see some much needed improvements, as well as an unforeseen mobo replacement. The last major upgrades being a replacement of the 9800 Pro for an XFX GeForce 7600 GT, 256 MB DDR3, 580MHz, AGP 8x and then maxing out the P4 with a 3.2GHz. Suffice to say when the system finally failed a few months ago, I was in need of a much better gaming rig! Before placing my order, I checked for the best pricing using PriceCanada.com and then using NCIX's price matching, was able to save $60! Too bad for NewEgg.ca which doesn't offer price matching! Everything shipped last night, except for the processor. Hopefully it'll be on its way soon! This gives me goose bumps! Oh boy am I excited about this one! I've been dreaming for quite some time about an FPS for EVE, and now CCP has announced that its Shanghai studio has been working on such a game! I first mentioned this desire of mine back in May of last year when I hinted that an EVE Online shooter would look somewhat like the dark and gory Gears of War XBOX 360 game. Later that year we got a glimpse of such a game (check the last video) but the details weren't too clear. Was this some sort of tease, or teaser? And then as recently as June of this year, I wrote an article about a possible EVE FPS. Man do I like to be proven right! Now entering its third year of production, DUST 514 is the primary development focus of CCP’s Shanghai studio. The team includes veteran designers of EVE Online and experienced talent from various sectors of the video game industry. Add to that the fact that the idea behind my latest contest is about integrating planetary conquest into the EVE the MMO, and you'll understand why I'm pretty proud of myself at this very moment! OK, that's enough chest pounding alpha-male behavior for one day! Back to my humble self I return. Still, I'm fracking excited about this one. Seriously! Nough said, I'm seeing it tonight! It's been a while since I last did one of these. Speedlinking posts take a lot of time to put together and as we're currently expecting a second MiniCK in the next few weeks, most of my free time over the past few months has been spent taking care of the two current ladies in my life, leaving little time for long gaming session or the research needed to put together these Speedlinking posts. EVE Player Blogs OPML Download updated - Ga'len updates the blog list, removing deadlinks and adding a few new ones. I've actually got a list of over40 blogs that I need to add. I plan to do this some time in the next few days! 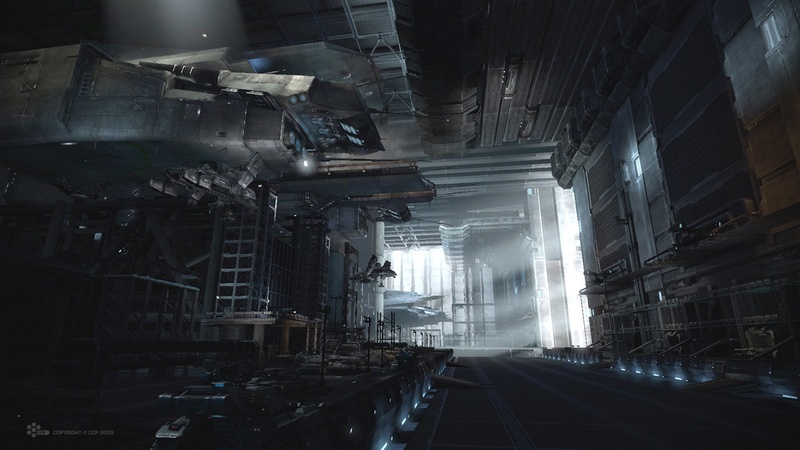 Tengu Ship Setup - Part I and Part II - The ever knowledgeable Kirith explores the innards of the Caldari Strategic Cruiser "Tengu"
Some EVE Players have great artistic talent and interesting sens of humour. Giant Ideas is one such fellow. Notice this poster ad about staying quiet in local! Mynxee, the now EON-published-head-of-the-Hellcats, recently published a guide to EVE Online Holdem, for those not willing to wait for Walking-in-Station to play their hand. Repeating the same mistake: Why EVE’s skill system is the way to go - Syncaine digs into the advantages of a skill system such as EVE's. Join the already voluminous discussion and see as well Kirith's take on the subject! In his article "The fight against RMT in EVE Online", James Egan dwelves into the hotbed that is Real Money Trades. See "Video interview focuses on emergent gameplay in EVE Online" for a great video interview of Nathan "Oveur" Richardsson over at Gamereactor (in Swedish). "The Second Coming of Moondoggie" - A better in-game browser anyone? Last not but least I want to remind you of the current contest I've got organized with CCP where you'll have a chance to interview a CCP Dev during one of my podcasts! Make sure to submit your entry before next Wednesday! Read about it on my blog, on the EVE Online site, and discuss it on the EVE Forums. Planetary control. Mention these two words to any EVE player and you'll see the same excitement in their face as you would from a preschooler in front of a candy store or a Christmas tree. In the latest EVE Chronicle, The Ever-Turning Wheels, we had the pleasure to immerse ourselves in the events surrounding a Caldari ODST strike force; couldn't help myself to plug in Halo ODST here! We've been teased by CCP a number of times over the last few years (remember the video on planetary flight or the recent FPS teaser) and it's something that could add some interesting game mechanics to our favourite sand box. Which got me thinking. What possibilities would planetary control allow players, corporations and alliances to do? What features would allow this? How would the CCP Devs implement this? I thought that this would be a great opportunity to get the EVE Blogosphere involved. Which brings me to the contest! The goal is to write an article on planetary control and how that would be implemented in EVE. Your article needs to cover what features, game mechanic, game design you would like to see implemented if (or when) planetary control/exploration/exploitation becomes available in EVE. You're required to write a two-part article. The first part needs to be a fiction piece that tells a story based on the feature (or game mechanic, game design, etc...) that you would like to see implemented, while the second part would be the actual description of how that would work in game. Each part of your article needs to be a minimum of 300 words (600 word minimum for the whole article). I'll be judging the entries and will pick the 5 best articles, amongst which I will randomly choose the winner. This lucky blogger will get to interview a CCP Dev during a MicroWarpCast podcast, with yours truly as host! Details on the podcast will be provided to the winner prior to the show's recording. The contest is open for submission until Wednesday August 19 11:59PM EDT. Please provide a link to your article in the comments and make sure to email me the URL (crazykinux[at]gmail.com). I'll then go over the articles and hope to be able to announced the winner on Friday the 21st. The podcast recording will occur shortly after that! Good luck to all and thanks for your participation and feedback! Similar in look and feel to 300, The Cup of Tears is scheduled to be released next year. I've been playing table top games, RPGs, or video games long enough to remember a time when we were looked down upon. As with video games today, back when I was teenager, Role Playing Games were being blamed for suicides and other evils. We, who enjoyed these games, were looked at as freaks and made fun of. But over time more and more kids, teenagers and young adults started playing these RPGs and the negative vibe eventually went the way of the dodo. Fast forward 25 years and we find ourselves, as (video) gamers in general, and MMORPG players in particular, in a similar situation. Actually, that not totally true. Over the last 2 to 3 years I've noticed a change in mass media's perception of gamers. A change for the positive. The nerds of the past have evolved into today's geeks (well some of us have anyways :p). With the advent of World of Warcraft, the term MMORPG has become much more mainstream recently. MMO players are less and less seen as antisocial-zombies living in virtual worlds as they escape the Real World. Studies are starting to come out which offer a positive image of gaming. MMORPG players are being seen as developping leadership skills due to the multiplayers colaborative nature of MMOs. 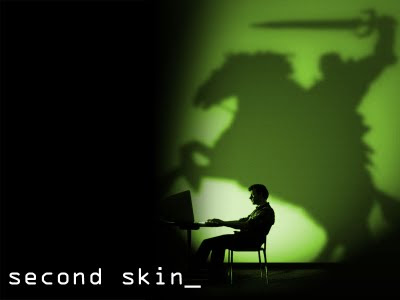 But then comes along a documentary like Second Skin. Premiered in March 2008, it follows World of Warcraft and Everquest players as their virtual lives clash with their real life obligations. But there's one big problem with the film. Now, don't get me wrong, the documentary is well made, the flow is just right and you can definitely see that the folks behind it are very talented. That's not where the problems lies. Let me explain. Earlier this week, I had the chance to see the documentary before its released on the web earlier today. As I started watching I was excited about the prospect of seeing how we, as MMORPG players, would be portrayed. I had my hopes up that it would show how these games have brought millions of people together from all over the world. How they have allowed us to learn new skills (writing, blogging, podcasting, leading, etc.) and discover hidden talents we did not know we had. Or how a 16 year-old could successfully lead a guild or corporation of over 50 people (from all walks of life, social background or professional careers) to accomplish difficult goals. But my hopes quickly came crashing down. What the folks behind Second Skin did though is focused on the "weird" behaviors of some MMO players. I'm not saying that everyone in the film is a weirdo, but what I am saying is that that's where the filmmakers decided to focus on. As I was watching the film, I couldn't help but tell myself that these were not the kind of folks I played with. These were not the types of people I had come to know over the last 5 years of playing EVE Online. And I don't think it's a "Well-this-is-how-WoW-players-are" kind of thing. I'm totally aware that a lot of MMO players have addictive-like behaviors when it comes to playing these games. I just don't buy the idea that we're all like that. Never have, never will. It wasn't true for RPGs a quarter of a century ago, and it's still not true today for MMO players. It's as if you did a movie on religion, but only focused on the fundamentalist. Or a movie on wine making, but only focused on alcoholics. I don't feel that the movie does a good job at presenting a fair and realistic view of the MMO Gaming community. I'd really be curious to know you're thoughts as well, but in my case this wasn't the MMO documentary I was hoping to see. Not by far. I'm still waiting for that one.